New P & O Australian cruise ship to be transvered to the parent company ! News in today is that the Carnival group have decided to transfer the new 142,000 grt cruise ship, which was ordered to be built for P & O Australia, to their own fleet. 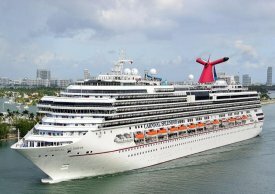 Instead they will send the 2008 built 113,323 grt ' Carnival Splendor ' to Australia . In 2010 this cruise ship had experienced mechanical problems, including a big engine room fire which resulted in the ship needing to be towed to a nearby port as the engines could not be restarted ! There was no hot food available and as most of her electrical systems were not working tinned food including tins of Spam were dropped on to the ship by helicopter so around 3,000 passengers and crew could have a cold meal of sorts ! The flushing system for the toilets were not working correctly and as a result the ship was nick named the ' PONG SHIP ' with many passengers sleeping on deck to get away from the smell from the toilets and the heat inside the ship with no air conditioning working ! And so again P & O Australia gets another old cruise ship ! 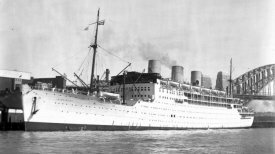 The last time a P & O Cruises ship, under one year old, operated a cruise from Australia was in 1932 when the newly launched three funnel ' RMS Strathaid ' made a five day cruise from Sydney to Norfolk Island, with passengers landed there by ships lifeboats, when on her maiden visit to Australia ! The P & O company then was British owned but now is part of the American Carnival group.